Safety shoes and boots are worn by many professionals, including those working in construction, utility, outdoor jobs and for anyone doing various forms of warehouse work. 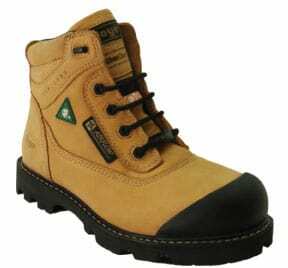 Safety shoes and boots are an essential requirement to protect the health and safety of workers and their feet. Having correctly fitting safety shoes or boots is important and could make a difference to the amount of protection that you gain. When purchasing safety footwear, remember that not all brands fit the same. For example, even though you may be a size 10 in one brand, you may find that a size 10.5 fits you better in another. Each brand has its own unique “last” or mould from which the shoe is made. Pay attention to your feet and how they feel in your safety shoes. For example, if you frequently have instances where you suffer from sore toes, blisters or bruising on your feet, then chances are that your shoes or boots aren’t the right size or the correct fit. In fact, they could be either too big, too small or the wrong width for your feet. When you’re trying on or choosing safety shoes or boots, always try and wear the type of socks you’ll be wearing during your work. Different socks can be of different thicknesses, so to gain an accurate idea of how the boot or shoe will feel when you’re wearing them at work; you need to have the same type of sock on. The best time to shop for safety footwear is at the end of the day after you have been on your feet all day. This will ensure that the footwear will fit you when your feet are at their largest volume. If you have wide feet, be sure to choose a wide fitting safety shoe in a 2E or 3E width. Try to keep at least a ½ inch of space from the end of your longest toe to the end of the shoe. TIP: with the steel toe cap it is difficult to feel the space available at the end of your longest toe. Remove the sock liner from the shoe or boot and stand on it. If you have a ½ inch of space at the end of the liner you have a good fit! Once you have purchased your new safety shoes, don’t forget to break them in. Like all new footwear, they will feel better and more comfortable if you get used to them gradually – and could help your performance at work too; the more comfortable your shoes feel, the more you will get done. Finally, don’t forget to make a note of the size, type and brand of shoe or boot you end up with. Although they should last for a good while and provide plenty of wear, when you need a new pair it will make life a lot easier if you know exactly what size, make and model you had last time. 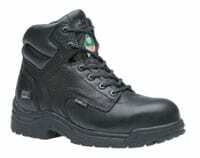 We carry a wide range of safety shoes. Call us for an appointment so one of our safety footwear experts can properly fit you for your new safety shoes.